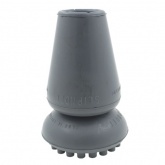 Unlike traditional rubber ferrules (rubber ferrules are the rubber stoppers that attach to the bottom of your crutches) which come with standard NHS hospital crutches, the Slipnott rubber ferrule is a high-quality ferrule that offers the user of crutches increased maneuverability, stability & safety on uneven surfaces. Their construction features a ball & socket joint allowing the ferrule’s extra large, slip-resistant base to be in contact with the ground at all times, even when it's used at an angle. Watch the video at the top of this page and see for yourself just how good the Slipnott ferrule is!